This page provides factual information on electronic cigarettes and includes links to further information and resources. A number of Coalition members have developed more detailed positions on e-cigarettes and these are also linked to below. 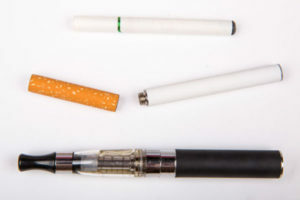 E-cigarettes are devices that allow users to inhale vaporised nicotine dissolved in propylene glycol or glycerine through a device which is sometimes shaped like a cigarette. Although nicotine is addictive, the harm caused by smoking is not from nicotine but from the smoke, which these devices do not contain. An electronic cigarette that is rechargeable and has a tank or reservoir which has to be filled with liquid nicotine. How are these devices regulated? Currently e-cigs are regulated by consumer product regulation. Since April 2016, they come under the revised EU Tobacco Products Directive (pdf), except for those products licensed by the Medicines and Healthcare Products Regulatory Agency as medicines. For more details on the two systems of regulation see the ASH briefing, FAQs from the European Commission and MHRA: Nicotine Containing Products. The latest data estimates that 3.2 million adults in Great Britain regularly use e-cigarettes. To find out more about who uses them, see the latest ASH factsheet (pdf) and Professor Robert West’s latest research. Public Health England – Electronic cigarettes: evdence review (pdf), Electronic cigarettes: uptake and marketing evidence review (pdf) and PHE Blog: E-cigarettes and harm reduction: where are we now and what next?